For Standard E, there really was a simple logic involved. 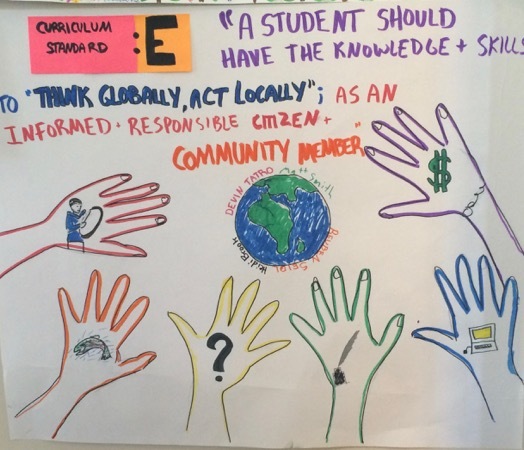 The idea with standard E is to “Think globally, act locally”. This is important because it is a standard for change, on every scale. 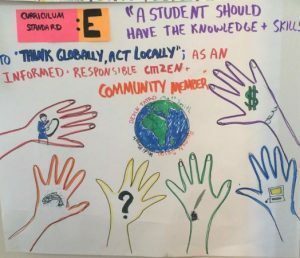 From this standard, students gain to learn knowledge about different things from all over the world, and then in return put that knowledge into a local scale, to help out locally which if done correctly, can begin to have an impact globally. There are many potential lessons for this standard. For example, for english classes you could look at different traditions or possibly stories of origin from different groups, and compare them to the local ones and find all of the similarities that exist from groups that probably never met each other. Another one you could do is look at what is happening in politics globally, and write to a president or national senator/representative, and then turn that to the local level by writing concerns wanting change to local or state officials. Overall I thoroughly enjoyed this standard and will try to implement it every chance I can. I really liked the visual on your poster for this standard. I think learning for students is really powerful when connections between home and somewhere half-way across the world are made in the classroom. Your lesson plan ideas encompass that really well! We have so many great resources and technologies to help students think with a global perspective today!! I liked your idea of writing a president; I wrote to the embassy of Swaziland for an elementary school assignment, and they sent a package full of photos and information. It made a huge impact to connect with a place so far away; I still remember it today. I think, for an English class, having international pen pals would be fun too. Amazing! That’s an awesome idea! I really like that idea of writing to senators. Giving students a higher, global purpose while tying it back into their background knowledge and experiences from home is definitely essential. Knowledge changes the knower, as I said in another post. The simple knowledge that other people think differently and do things differently can have a tremendous impact on students and their own level of self-knowledge.